I've long admired this charming cottage owned by Jessica Helgerson and her architect husband Yianna Doulis, and I'm excited to be sharing it with you today. 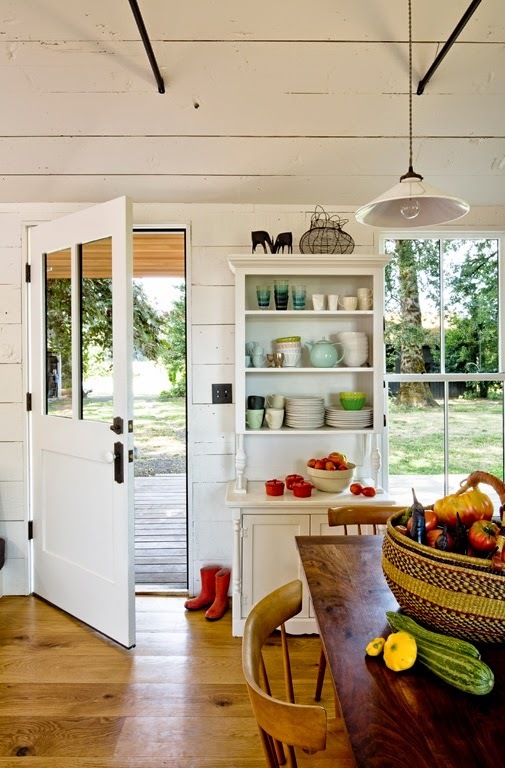 Jessica and Yianni purchased and remodeled the 540 sq ft Sauvie Island cottage, intending to make it their weekend retreat. 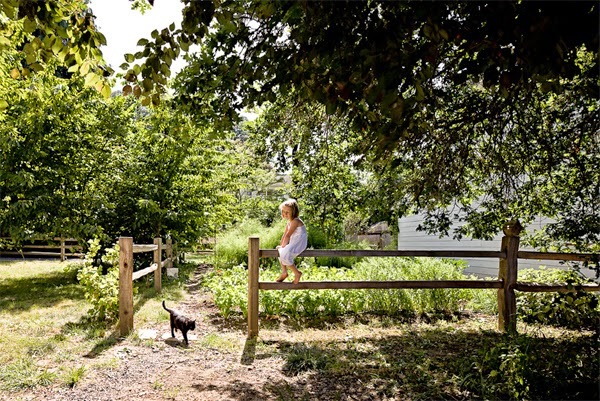 It didn't take long, however, before the tiny house on five acres became a full-time home for the couple and their two children. The cottage began life as part of Vanport Village, an Oregon development built in the early1940's to house shipyard workers. 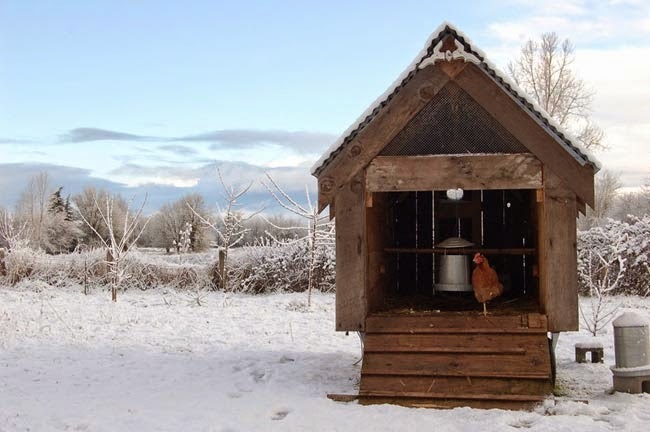 In 1948 the area was destroyed by a flood and the cottage was floated down the Columbia River to Sauvie Island, where it served as the goose-check station. Much later it was remodeled to become a rental house. After Jessica and Yianni bought the neglected property in 2008 they decided to retain the existing cottage footprint, gutting and redesigning it for maximum efficiency. Nearly all of the remodeling was done with reclaimed materials. The new green roof is both whimsical and practical; planted with moss and ferns gathered along the Columbia Gorge it provides efficient insulation. The entry door opens into a great room; to the left is the kitchen and dining area, and to the right is the living room. Many of the insulated cottage walls are covered in wood cladding reclaimed from a barn on the property. The wood stove heats the entire cottage. The couple stained one wall and painted the rest white. Native Oregon white oak was used for the flooring. Yianni made the beautiful farm table from locally salvaged walnut. The vintage range is a Craigslist find. 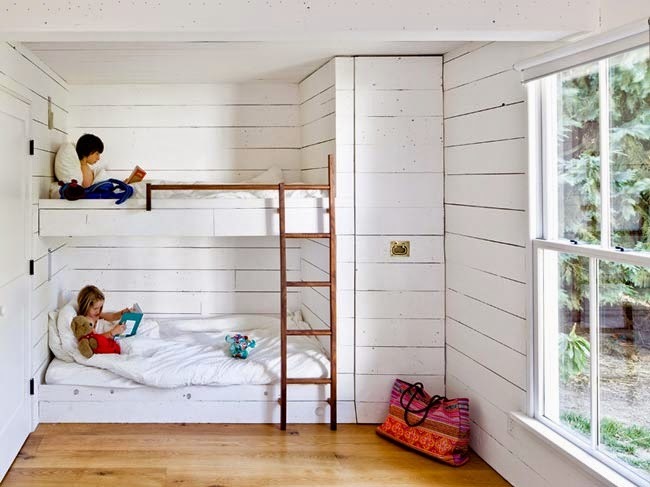 A walnut ladder provides access to the parents' sleeping loft. Large, comfortable built-in sofas double as guest beds; drawers underneath hold the children's toys. 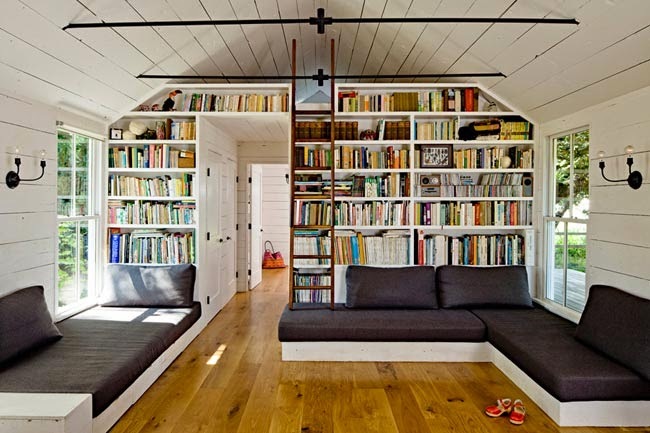 Books and other items are stowed in the shelves lining the wall. The home now has tall, high-efficiency windows that bring in more natural light, and are large enough to allow the kids and cats to go in and out of the house. Such a fun idea. A casement window opens up the loft to the outdoors. 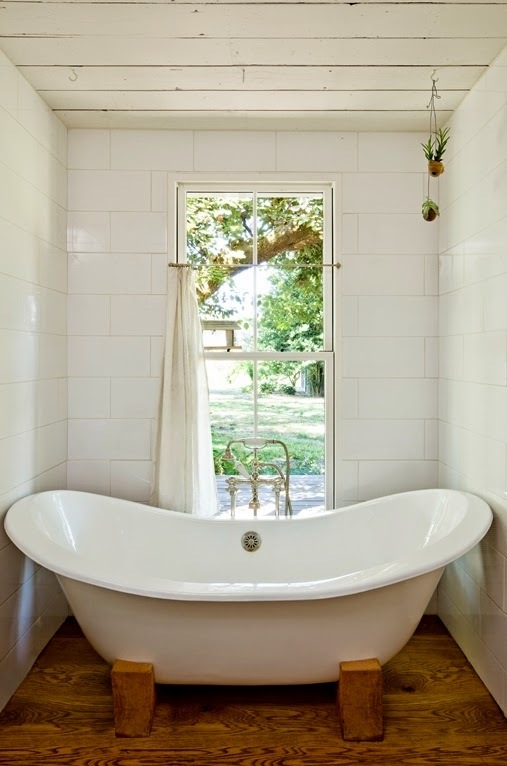 The bathroom is packed with cottage charm. Storage is concealed in the wall opposite the sink. Salvaged from a friend's demolition site, the soaking tub has new wooden feet designed and built by Yianni. The children's room has two bunk beds with built-in storage. A pull-out closet at the end of the bunks offers drawers and a hanging rod. There is a double bed for guests in the room, as well. 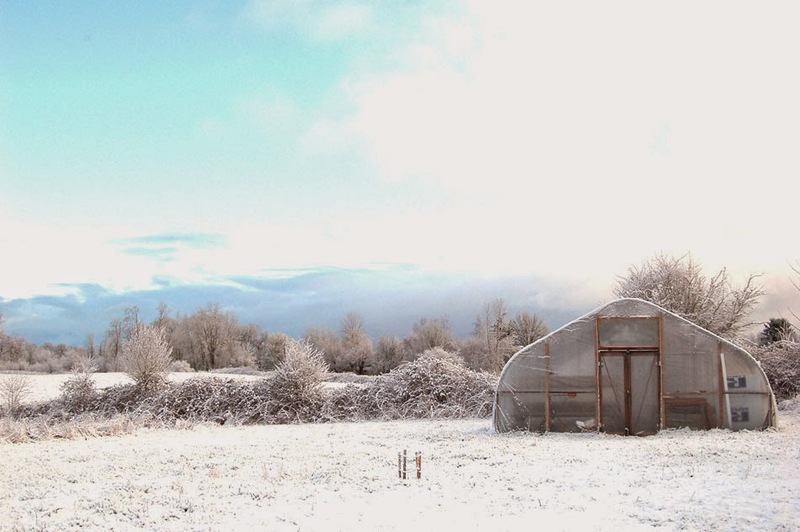 Life for this young family involves growing much of their own food. They've planted vegetable gardens, berries and fruit trees. In a further move toward self-sufficiency they raise chickens for meat and eggs, keep bees and make cheese from a neighbor's goats and cows. Jessica Helgerson and Yianni Doulis are successful professionals who have chosen to move out of the city and live a simpler life. On the weekend their cottage is often filled with family and friends coming from nearby Portland to enjoy a bit of country life. Is it any wonder? I wish to express my thanks to Jessica Helgerson Interior Design for allowing me the privilege of sharing her "Tiny House". I love it. I could see Hubby and I living in it. LOVE this place and like Su I've seen this house before and pinned it several times. Great use of space, idyllic lifestyle, and plainly lovely!! I love everything. Not sure why the kids and cats go out the windows. They don't have many belongings but that's a good thing. Thanks for sharing. I really enjoyed hearing the story of how this clever couple transformed their little cottage into a place bursting with innovative ideas and more than enough space for their family and friends. I absolutely fell in love with the moss covered roof! So charming. I like the open floor concept as well. They are making some truly wonderful memories living so simply and focusing instead on life's many joys! Wow, amazing! I love it. I love the built in sofas. Great idea and so cozy. I love the house....it is so pretty and so cozy looking...would love to have it!! Lots of really great space saving ideas built into this house for sure! Some people are just so creative. I love the simplicity of the design and of their lifestyle. I have never seen this cottage before, it's super charming, Nancy, thanks for sharing! 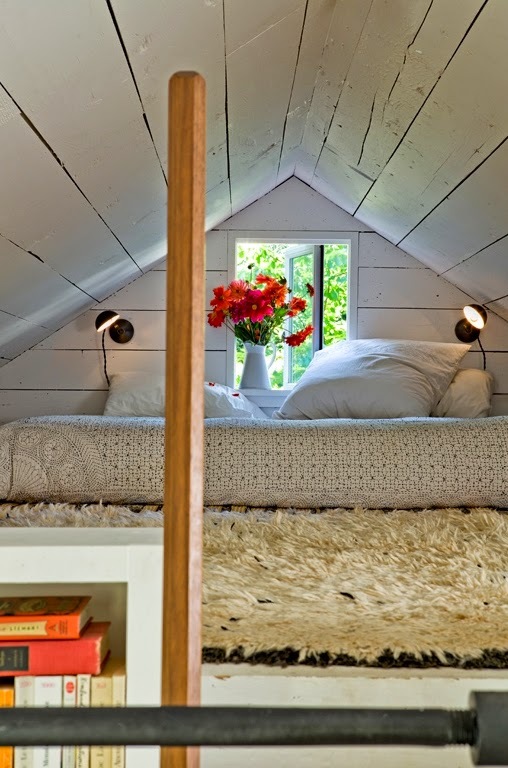 What a darling cottage - love all the neat space saving ideas! Glad you enjoyed it. I like all those space saving ideas, too! Ohhhhh love this cottage. What a great use of the space. So pretty and natural. Very charming. Thanks for sharing this sweet little living spaces. I love this series. What a warm and cozy cottage and lovely pictures...nice story Nancy! I love the warm feeling this home gives despite being mostly white. By far . . . my favorite . . . love the ook wall, the openness . . . the bunk room with an extra double, the chickens, bees, the living the land . . .
and the hand made table . . . oh my . . .
Not sure why it happens . . . but it does happen on some comments when I am writing from my iPad. I go back to reread what I have written and if there is a mistake I cannot correct. You'll see where I tried! I love the BOOK wall . 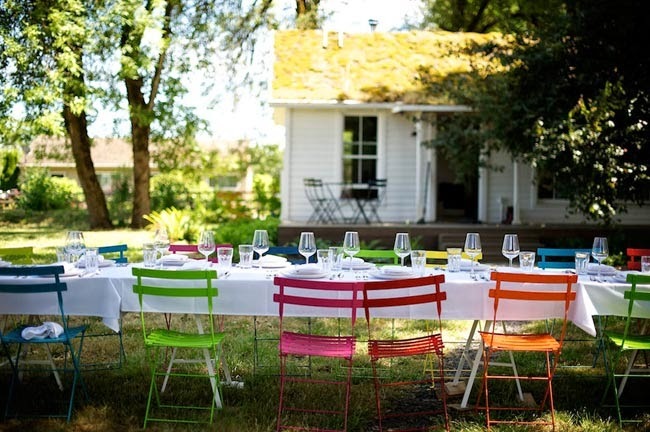 . .
Lovely home & lifestyle. I enjoyed this feature very much! Thank you, Lin. I'm glad you enjoyed it. It is refreshing to see young people these days who are down sizing. Such a cute cottage. My question is: Will they be able to continue living in this tiny place, without adding on, when the children are teenagers? Thanks for sharing such a quaint and cozy home with us! I love all the white and the wood cladding. Perfection and simple!! Such a cosy little cottage. I love the simplicity. Thank you for sharing. They created a wonderful space for their family. Thanks, Teri. OMYGOSH...I am sooo in love. This little, adorable space is such a dream of mine. I love it all...especially love the all white...no clutter....CLEAN....I am such a collector at heart, I couldn't do it...but I sure admire this young couple...think how easy it must be to keep. Love it. 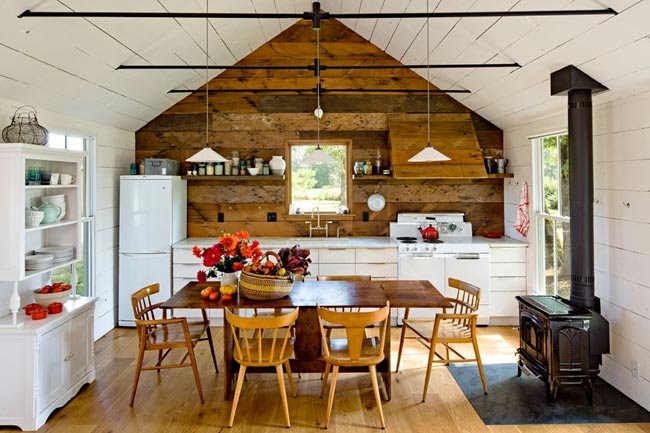 What a bright and beautiful space, pretty and practical, full of natural light and rustic modern style. The kitchen is my favourite room and that wooden stove sure works hard to warm the entire place! Thanks for sharing, Nancy. This is a great series. And what a lovely and efficient home they've made. I love it. Thank you so much for sharing this with us. This is one of my favorite small spaces so far. I really enjoy this series and your beautiful photos! The photos taken by Lincoln Barbour are beautiful, indeed. What a lovely little cottage! Thanks for sharing it with us! Wow- it seems so big... Feature wall in the kitchen area is absolutely amazing- simple & beautiful! What a gorgeous home with a neat history. And on 5 acres, you have all the room you need!! Thank you for sharing this neat series on the Art of Home-Making Mondays! I love the creative use of space and the repurposing of so many materials. I have been reading recently about people making the choice to live smaller and have a life instead of having lots of stuff and a demanding job necessary to pay for all the stuff. Goodness, I'm not sure my comment posted so I'll try again. 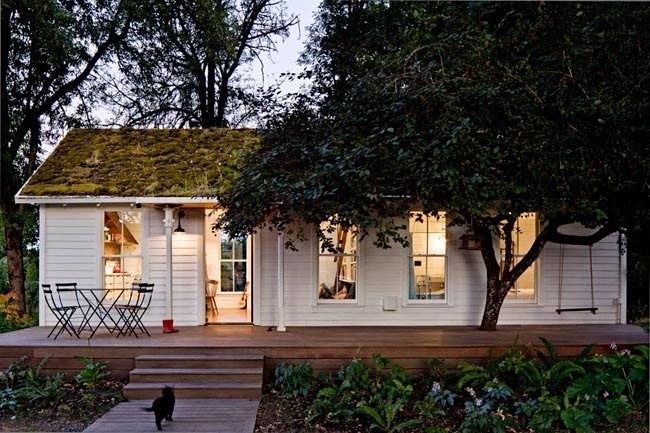 I do love this cottage -- the brightness and airiness -- and their clever use of space! Thanks for your persistence. :) It is a lovely home, and I'm happy I was able to share it. Enjoy your day! Nancy this cottage is absolutely darling! May be one of my favorites. 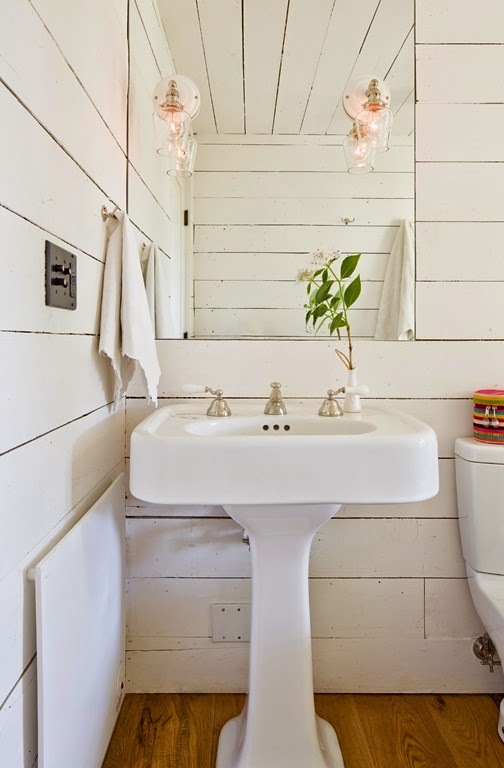 Love all of the beautiful white planked walls. What a wonderful place for the two little ones to grow up! thanks for sharing with SYC. I enjoyed this tour so! So much charm! 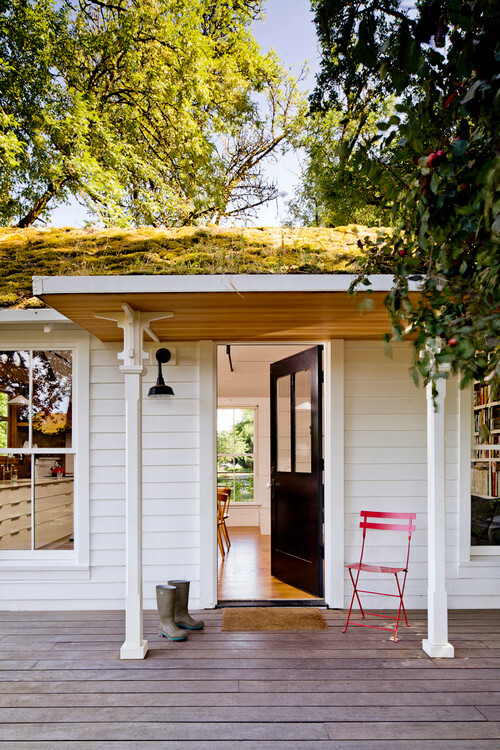 I just love the moss-covered roof! Hi my friend, just hopping in to say that you will be featured at SYC this week.